Case Packers is designed to automatically set-up and top-load RSC (Regularly Slotted Carton) cases with your pillow bags of Filled product. The filled cases are closed and sealed by hot melt adhesive prior to being delivered out of the machine. We offer best quality Case Packers at industry leading price. 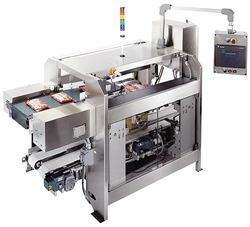 These filling machines are designed and developed to fill empty cartons, jars and cans. Our machine is made of superior quality stainless steel that is procured from reliable vendors. These products find their application in manufacturing industries. They undergo various quality assurance tests, to ensure high quality. Our machine is highly appreciated for their durability, compact design, corrosion resistance and hassle free working. Product Acceleration Belt: To Handel The product in better and faster manner. Looking for Case Packers ?